AT LAST! It’s big Number 20 – and the last of my PB & J-induced recipe insanity. It’s kinda my favorite of the whole bunch. Inspired by Number 29 on 29 Ways to Honor the Glory of Peanut Butter and Jelly and in particular, the recipe for Chicken Lollipops by Pepper PH, this recipe is pretty much spot on to the “real” thing. At first blush, one might think (as did I): yuck! But upon further reflection, I remembered one of my long-ago pre-gan favorites, chicken satay: tender strips of chicken that had been marinated in yogurt and spices and then grilled – then dipped in a thick and spicy peanut sauce. Break out the Singha! Speaking of big: a BIG thank you to everyone who has stuck with me through Vegan MoFo 2013. I asked an awful lot of you with 20+ posts this month. I really appreciate all of the comments and encouragement. I’ll be back to my normal posting routine (well, kind of normal – the Virtual Vegan Potluck is coming up soon, after all, and I’ll be posting some info about that). This one takes a little bit of effort, but it’s worth the end result: tender vegan satay with two slightly sweet and slightly spicy dipping sauces. Soak about 15 skewers in water for about 30 minutes before grilling the seitan. In a bowl, combine the marinade ingredients, add the seitan strips and gently stir to coat. Let the seitan marinate for about 2 hours. In a blender or food processor, add the peanut butter through the lime juice and process until smooth. Scrape down the sides and then with the blender running, pour in the hot water. Use more water if the sauce seems too thick. Pour the sauce into a bowl and set aside. In a saucepan, saute the onion in the soy sauce and water for about 10 minutes. They should be nicely brown and getting a little syrupy. Add the garlic and cook for another minute or so. Add the remaining ingredients, bring to a boil, then turn down the heat and cover. Cook until very soft – about 10 minutes. Remove from the heat and allow to cool for a little bit. Process in a blender or food processor until very smooth. Set aside. Heat a grill pan (or grill), spray lightly with oil and grill the seitan strips until you have nice brown stripes; flip and grill the other side. Serve the satay on a bed of fresh lettuce, sprinkle with cilantro and serve with the spicy peanut sauce and the plum BBQ sauce. Thank you, Sandy!! It was fun, but boy am I glad it’s over! I’ve never been a fan of chicken, I think I would much prefer this. Well done with your MoFo recipes – great job! Oh, yes, seitan is much better than chicken! No scary bits! I’m exhausted ;-)! Actually, it surprised ME that there were so many ways to use/eat PB&J! This looks amazing! I used to love satay. Congrats on finishing all 20 posts in a month! I’ve really enjoyed your theme and reading all of your posts. Thanks, Sophie! These would be great w/ just the peanut sauce for sure. I am sure that my readers are just as happy (if not more…) as I am that this month is OVER! Fun, but…time to close up the peanut butter jar. Thanks, Celeste – it actually has been a lot of fun. Oh wow!! I think this may be my fave too, I love satay sauce 🙂 I am so amazed with all the different PB&J recipes you’ve done, so inventive! Are you sick of peanut butter now or has it simply strengthed your love? Mmm…I also have fond memories of chicken satay. This looks awesome! Congrats on making it through Vegan MoFo! 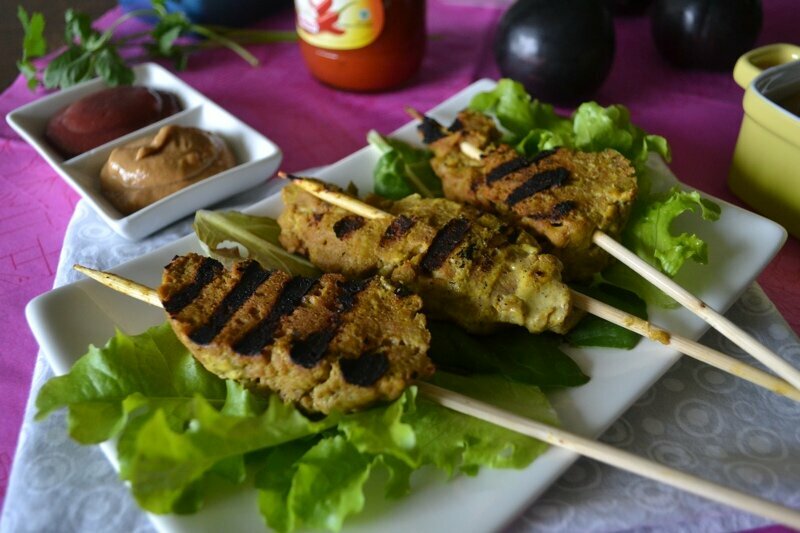 These seitan satay sticks look delicious! I’m looking forward to the upcoming VVP! I love how satay can be kid friendly but still appear somewhat adult at the same time. Who can resist dipping?? It’s kinda all about the sauces ;-)! That is an insane amount of PBJ mofo posts!! Congratulations! I havent had satays in so long.. i have only tried seitan in the restaurants and it is a hit or a miss 50% of the times. maybe i should make some satays at home to change up my mind! I am quite fond of stick food! Doused with Pb and jelly stand-ins, I am happy.